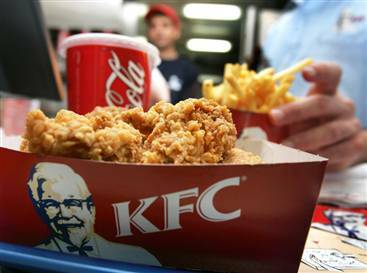 Popular fast food joint KFC has been asked to pay Rs 432 million (AU$8 million) to the family of a young girl who suffered a brain damage after eating chicken wraps at one of the fast food giants in Australia. According to the family of Monika Samaan, then 7-year-old girl contracted salmonella poisoning after consuming a KFC chicken wrap. They alleged that the girl was in comma and also left with brain damage. Stephen Rothman, New South Wales Supreme Court Justice, pronounced that KFC was guilty of the food poisoning adding that AU$8 million damages plus legal costs to the family. KFC however, refuted all charges and said that it would appeal. Staff at a KFC outlet where a customer claims to have developed severe salmonella poisoning would drop chicken pieces on the floor, help themselves to food and throw chicken strips at each other as ”pranks”, a court has been told. Three former staff at KFC Villawood were giving evidence in a Supreme Court case in which Monika Samaan, 11, is suing the fast food giant, claiming that the source of her salmonella poisoning was a Twister her father said he bought at the outlet on October 24, 2005. KFC has denied responsibility for her illness, which has left her with severe brain damage and quadriplegia. Hatem Alhindawiq, 20, who began working at the Villawood branch in September 2005, told the court that a few weeks after he started there he and his friends would lock each other in the cool room and ”maybe chuck chips … at each other, that kind of stuff”. They would also throw chicken nuggets and chicken strips and ”muck around, slap each other and run away, all that sort of stuff”, he said, adding that chicken strips were ”the easiest to chuck”. Danielle Cabassi, 19, who worked at the branch for two years from 2005, said she often saw the cooks fail to wash their hands between working with raw chicken and removing cooked chicken from the fryer. They would use tongs, but there was still blood on their hands, the interior design student said. Workers at the burger station would ”nearly all the time” wear only one glove when they were supposed to wear two, she said. Ms Cabassi agreed that during the few hours she worked in October 2005 she was at the front counter with her back to people working in the kitchen. Zainab Ruda saw cooked chicken fall to the floor and other workers eat food from preparation areas during the three or fours years she worked there from about 2003. She agreed she had completed a training booklet which included questions on cross-contamination of food, but told the court, ”a few comprehension questions doesn’t show straight understanding”. The family expressed their satisfaction with the verdict, but was however, upset with KFC's plan to appeal.